At the beginning, the tiny oysters were just settling onto oyster shells in small plastic pools outside. The water in the pools was a saline solution, mixed in large barrel trash cans, and pumped into the pools. At the time, the pools were covered to prevent rain from falling into them and diluting the solution. The blue crabs were purchased in Port Aransas and traveled back to TAMU-CC in large buckets whose lids are equipped with air pumps. 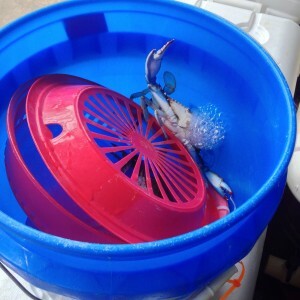 Each bucket held three crabs, two in plastic plate holder/strainer contraptions, and one free. They had to be kept separate so that they would not fight with each other in the buckets. Back at campus, they were put into glass aquariums temporarily. Later, they would each have their own plastic tank, although not every tank has a crab, and some only have oysters in protective mesh bags (there are oysters in every tank). Every week, the water in the tanks has to be changed, which involves draining each tank, replacing it with new saline solution, and managing to do all of that without getting pinched. The crabs were fed a very specific amount of oyster, which had to be measured on a scale. At a later date, we collected oysters in the field to feed the crabs. 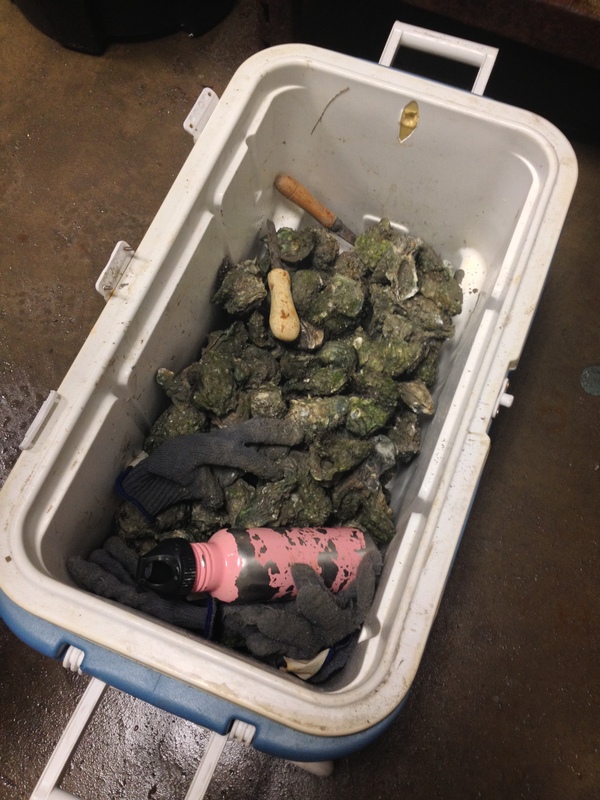 Oysters grow in clusters for the most part, and provide habitats for baby crabs, one of which managed to hitchhike back to the lab with us. I also did mock data analysis, which involved using J Image to set a scale for a picture of a numbered oyster shell on graph paper (pixels to centimeters) by drawing a straight line across a square of the graph paper the oyster shell had been photographed on. The outline of the shell was then traced and the program calculated the area. This data was collected in an Excel file, then the data on the mass of the oysters’ tissue was added in. Scatter plots demonstrating the relationship between surface area and tissue mass were created and the equation and r2 value were found as well. 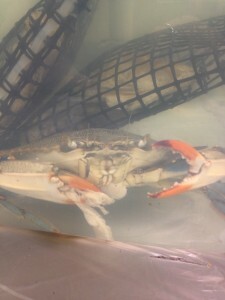 Crabs can be very protective of their space and do not like being handled. They respond very quickly to being fed, grasping the food almost immediately when it’s put in their tank. They also bubble when they are taken out of the water, which can be surprising the first time you see it. Frankly, I didn’t know what oysters looked like as babies, so that was something new. There was a lot about creating the environment for the crabs/oysters that was interesting and now I can say that I’ve made salt water. The most new knowledge was gained through the data collection, where I had to use new (to me) programs and techniques to gather information. It gave me real insight into how much work goes into gathering data, discovering relationships, and documenting everything. When will the oysters begin to show obvious reactions to the crabs’ presence? 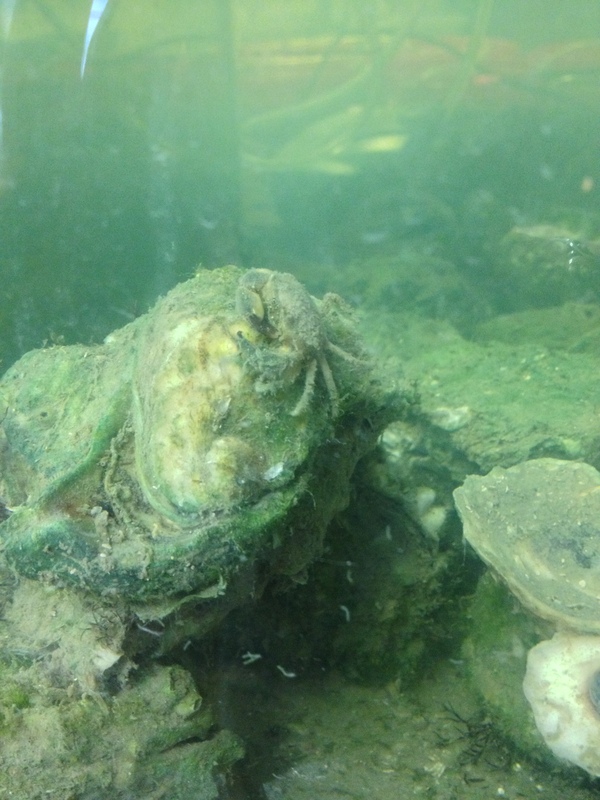 Will the crabs’ behavior change as the oyster grow? What modifications will have to be made to the setup over time? Will any have to be made? The main connection between this research and teaching would probably be the environmental factor: Why do we have to use salt water? Why do we change the water? Where do these animals live? “Organisms and Environments” is a TEK from kindergarten to 5th grade, although the content does vary from grade to grade. In 4th and 5th grade, the TEK specifies that students should learn about adaption, which is exactly what the oysters are doing. It also ties into our local environment and conservation-the crabs and oysters are local, which could lead to a discussion on the importance of keeping our water clean. Conservation is a TEK in 1st, 3rd, 4th, and 5th grade and an important concept for us to discuss with our students in general. Area could be discussed with the students, since the use of graph paper would allow for educated guesses at shell area. Although finding irregular areas may not be accessible in most elementary grades, area is a TEK from 2nd grade and up. Estimation could also tie into this exercise, and it is a TEK at every elementary level.